7 Cool Ways To Reuse Your Mom's Old Saree! We girls may not wear sarees often, but we definitely love them from the borders of our heart. Be it a family wedding or a special occasion, the six yards of elegance never fails to impress. More so, when borrowed from our mother or grandmother’s closet. You gotta admit ladies, they seem to always have better taste and a better judgement of quality! So, if you happen to find a saree that your mom is bored of, don’t let her give it away! Instead, repurpose it into something fabulous that you can use. 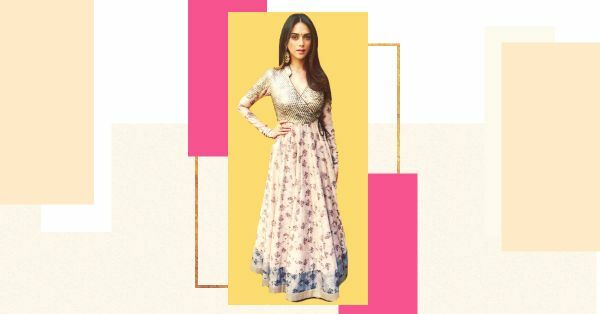 Need another reason to twirl your lehenga at weddings? Showing off, the beautiful conversion of old Banarsi sarees into gorgeous silk lehengas. Repurpose silk sarees to create stunning lehenga skirts with a matching blouse, a contrasting dupatta can do wonders for the ensemble. Rich silk fabrics in bold colours are ideal for this look. Struggling to find handbags to pair with your Indian wear? Why not, create your own. Ask your masterji to create colourful traditional potli bags using old saree pieces or even a half battered dupatta. Amaze your mom with your creativity and turn these swatches into totes, potli bags and slings for festive occasions. 3. Get gown for real! Give your western gowns an ethnic twist by using your mom’s saree to create them. Bright hues, traditional patterns and modern design will together give you an outfit that will make you stand out in a crowd! There is a shade of red for every woman- Audrey Hepburn.. Basic stoles and dupattas are a must-have in every girl’s wardrobe. An easier way to add more to your wardrobe is to create them from old sarees. You can use the borders from the sarees pallu to make them look more attractive. Put your grandmother’s cotton sarees to good use by converting them into pretty capes and shrugs. Easy cover-ups for Indian and western separates, they look super chic. 6. Care for some cushions? Dreaming of a room that looks like a Pinterest inspiration board? This great hack will take you a step closer to achieving it. Use sarees that match your room’s colour scheme to create cushion and bed covers. Stitch together saree pallus and create geometric patterns. You’ll absolutely love the result! Cotton sarees lend themselves really easily to cushion covers and bed linen. 7. A dress to impress! This is probably the easiest hack. All you have to do is choose a saree with a floral or tropical print and ask your local darzee for help! Maxi, midi or mini, go for a length that suits your body type and voila, you have a stylish, and unique ensemble.